When you start digging into what it means to eat healthy, wholesome, “real” foods, you’ll hear person after person tell you that these foods can really only be found around the perimeter of the supermarket, not in the inner aisles. Yet if you were to actually walk those aisles and read the claims on the packages, you’d hear a vastly different story. Told by the manufacturers. And clever marketers. Who want you to think this fake, processed, chemical-laden, harmful, nothing-real-about-it food is actually life-giving and beneficial for you and your family. Well, I think that’s pretty clear. We’ve been learning, many of us the hard way after years of terrible health, that truly nutritious, healing, wholesome food does not come in colorful, cartoon-character laden packages and cellophane wrappers. Rather it comes from foods that are whole, fresh, local, seasonal, organically or ecologically grown and raised, and so on. Each and every time we go out to shop, we’re bombarded with messages from those fancy marketing experts, trying to make us believe (whether consciously or un-consicously) that their processed package actually contains something healthier than the others. That their product is indeed fresh, natural, pure, wholesome, full of nutrients, from quaint farms and happy, healthy animals. Food packaging is designed to entice you. The manufacturer—that word, manufacturer, in relation to food, should scare you—wants you to buy their product. They have become masters at “cherry picking” the only redeemable qualities of their food products and exploiting those qualities to lure you into a purchase. But beware. It’s a shell game. Peter Pan Creamy Peanut Butter’s front label boasts “No Sugar Added”. That sounds healthy. Let’s buy it. Wait! Remember that the front of the package is only designed to sell the product. The truth can usually be found on the back. Read the ingredients. It’s true, there isn’t any sugar added. But the second ingredient is partially hydrogenated cottonseed and rapeseed (canola) oil and the fourth is sucralose (Splenda). Sugar in this case isn’t the problem. Trans fats and artificial sweeteners are. Deep down, we know it’s bunk, but these messages and buzzwords are created with psychology in mind. They’re made to trick us, even when we know better, even when we’re becoming more informed about our food supply and what we put into our bodies. Today I’m going to pull the curtain back on some of these terms of trickery, these clever ways they’re attempting to deceive us. Perhaps you’ve fallen for some of them. I know I have. They’re good, these marketing departments. They know their stuff. Eggs labeled as fresh, I get… dry packaged noodles that you heat in a microwave? Fresh? I’m confused. Technically, this term is only meant to distinguish between meat (specifically poultry) that has or hasn’t been handled at a temperature below 26 F (ie. it hasn’t been frozen). Beyond that, this term has no technical meaning on a label. Another variation on this is “farm fresh”, which literally means nothing. All food, at some point or another, technically came from a farm (goodness gracious, we hope). But when a food is labelled as “farm fresh” it does not in any way indicate the manner in which the food was raised. 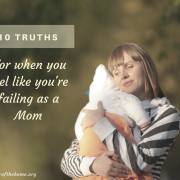 For example, an egg from both a cramped, caged chicken that has never seen the light of day AND an egg from a chicken freely roaming on pasture, eating worms and grubs and getting exercise and fresh air — both of these eggs can be labelled as “fresh”. Unfortunately, egg labels are particularly confusing. Organic and free-range might not mean a chicken that’s pecking around outside, despite the pretty farm field pictured on the carton. Omega-3 eggs are mostly likely from caged eggs eating a fortified diet, but doesn’t imply anything about their living conditions. Grain Fed isn’t a good thing; it’s actually the opposite. You want a hen that forages on worms and grubs it finds in the dirt and grass. And on it goes… check out this post for a really good look at deciphering egg labels. Natural? 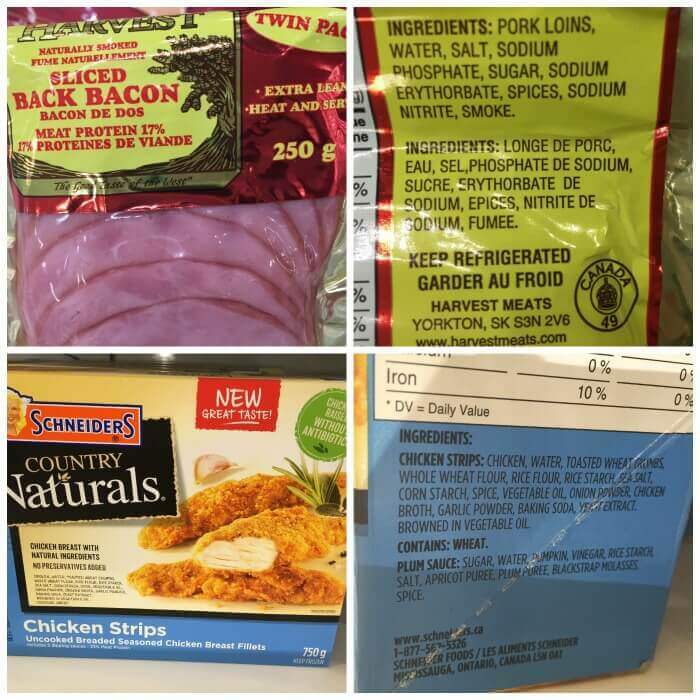 This back bacon is “naturally smoked”, but yet the ingredients contain several preservatives and the use of sodium nitrite, known to have links to cancer. Or how about the Country Naturals Chicken Strips? The ingredients don’t seem too bad, except that they contain MSG (yeast extract) and refined vegetable oils (bad fats), and did you notice the claim about the chicken being raised without antibiotics? Yet with no other substantiation for this claim, all they’re likely referring to is the legally-required withdrawal period before an animal is allowed to be killed, after it has received antibiotics. The term “fresh” is child’s play when it comes to food terminology. It’s when we get to “natural” that the stakes get a whole lot higher. The only official definition of “natural” when it comes to food labelling comes from the USDA (which actually refers to meat and poultry), which states that a food product or ingredient is “all natural” or contains “nothing artificial”, or that it is not natural if it contains synthetic or artificial ingredients (source). But, when it comes to all other packaged foods, the FDA has not actually come up with a definition for the word “natural”. Which allows companies the freedom to define it however they want. Essentially, when we see “natural” or “all-natural” on a food label, it should mean that it does not contain anything synthetic or artificial. Which would be good news. Except that we can find example after example of product labelling in complete opposition to that, and even including ingredients like High Fructose Corn Syrup or GMOs. See that claim “Naturally Flavored” on the front of the box? Even a quick look over the ingredients will tell you that they are essentially made up of various types of sugar, starch, hydrogenated oil, preservatives and emulsifiers, with a bit of pear puree and grape juice added in. 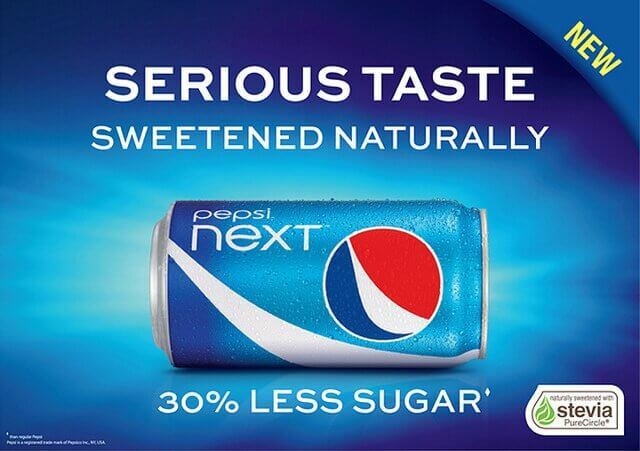 About the only “natural flavor” I can really see is, oh yes, the words “natural flavor” which mean precisely nothing . What can we gather from this? That “natural” is not a term we can trust, and we need to go straight to the ingredients instead. Although this word is not always overtly used, it is frequently implied. One example of a product being promoted as healthy, even if they don’t use the actual word in their advertising, is Nutella, a chocolate-hazlenut spread very popular in Europe. 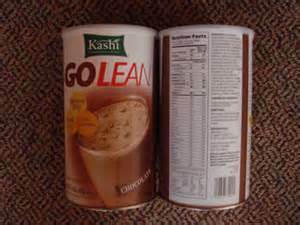 Commercials like this go out of their way to showcase it as a great addition to a healthy breakfast (mentioning foods like whole grain toast or waffles), and say that it is made with “simple quality ingredients like hazlenuts, skim milk and a hint of cocoa”. Except that in these screenshots from the official Nutella website, you can clearly see that 1) SUGAR is the first ingredient in Nutella, and 2) there are actually a whopping 31 grams of sugar in every 2 tablespoon serving! Not so simple or healthy, is it? Note the words “Gluten Free” under “Rice Pudding” on the left, not to mention words like “Made With Simple Ingredients”. Surely this is a healthy snack, right? Until you look on the back and see that it’s sweetened with sucralose, a completely artificial sweetener! Gluten free gets a lot of good press these days, being hailed as a healthier choice, even though a huge percentage of products labelled gluten-free on the market are actually highly processed, contain large amounts of sugar, as well as plenty of preservatives, artificial flavors and colors and fillers. In other words, they’re junk food with a “Gluten Free” label slapped across the front. Now, I’m not saying the product isn’t gluten free. It probably is. What I am saying is this is a buzzword that means nothing in the context of so many products, yet it’s added to make the consumer assume it’s a healthier choice. Organic mac & cheese is still just that… processed mac & cheese. And this organic broth? 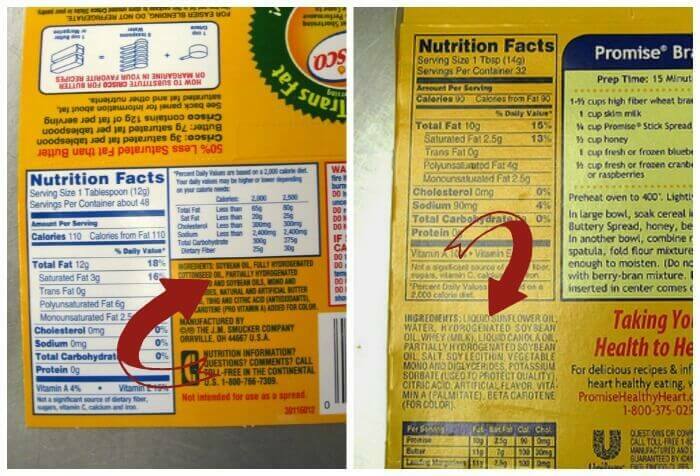 It still contains MSG (yeast extract), sugar, and canola oil. Organics have seriously flooded the market over the past 5-10 years, and in many ways, that’s a really, really good thing. But sometimes, it can also be somewhat deceptive when we see that glorious “I’m Organic!” label catch our eye, so let’s be real about what organic does and doesn’t mean. As with the “Gluten Free” label, “Organic” gets slapped on a whole lot of very processed, junky foods. Just because it says it’s organic does not mean that it’s automatically good for you. 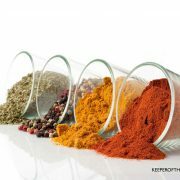 Specific ingredients are not required to be organic in multi-ingredient foods. Some examples include enzymes in yogurt, pectin in fruit jams, or baking soda in baked goods. 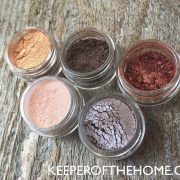 You can actually see a full, detailed list of both the synthetic and non-synthetic ingredients to which this rule applies here (scroll down quite a ways). There are a large number of synthetic substances allowed for use in both organic crop production and livestock production. I was particularly surprised by some on the list for livestock – they included vaccinations as well as quite a number of pharmaceuticals that may be administered by registered veterinarians or for specific health-related purposes. See the list for yourself. While organic requirements are certainly a far, far cry from the standards for conventional livestock, they still do NOT guarantee that animals are grazing on pasture or free-roaming to the degree that you might think. For ruminants (ie. cows), they are required to eat outdoors during grazing season, or when the weather is not inclement (a term left up for interpretation), but between the official grazing seasons (when the grass is not actively growing, especially in more Northern climates), they are typically housed in barns and fed grains. For poultry, they are only required to have “access to the outdoors” but this does not equate to free-ranging, outdoor-roaming birds in most circumstances. Usually it’s more of an open-concept barn (ie. no cages), where there is at least one door leading outdoors which the birds may or may not take advantage of. Many of them are so used to being indoors that they don’t automatically seek out the door that will lead them to pasture if they are not specifically led there. You can read some of the rules here, or something like this very detailed organic certification document (this one is for Washington State in particular) here. All that said, I’m not saying don’t buy organic. In fact, I will still frequently buy organic over conventional, particularly when it comes to fats, meat and poultry, dairy, and produce (like the Dirty Dozen), because I still feel that it’s a choice for the better (both environmentally and for our family). But even better than organic? Buy local, talk to farmers, visit the actual farms, ask really good questions about how produce is grown or animals are raised. This is a far more reliable way to know what you’re getting than just looking for that certified organic logo. Hmm… Oreos and Chips Ahoy? Methinks this is junk food with clever marketing. 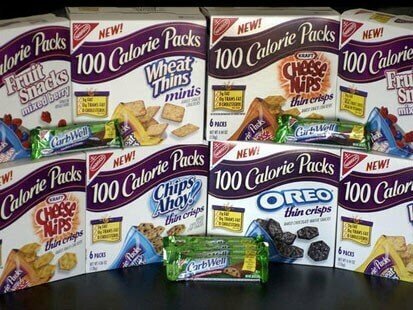 Just because a package says it only contains “100 calories” doesn’t make it better or different than any other processed junk or snack food, nor does it contain healthier ingredients. All they are is smaller. Hence the 100 calories. It’s basically just a couple bites, so the 100 calories is simply based on the serving size. Which should indicate to you how many calroies you’re getting with the regular size (most of which probably come from sugar or bad fats, but that’s another story)! This one is interesting. Food manufacturers can claim this even if the food actually contains trans fat. What, you say? Isn’t that straight out lying? Well, here’s the thing: If the total amount of trans fat is less than 0.5 grams per serving, then the package and nutrition facts label can state that the product contains 0 grams of trans fat. It’s madness, right? And yet, completely legal. Check out the FDA information on ingredients, packaging and labeling. The better way to avoid trans fats (other than simply avoiding processed foods, refined oils and bad fats themselves, which is the very BEST way), is to look carefully at the ingredients list. What you want to avoid is anything with the words “hydrogenated oils” OR “partially-hydrogenated oils” or even “shortening” (some kinds of shortening are great, like palm shortening, but when we’re talking about processed foods, you want to just avoid it). What does a “natural sweetener” mean in the food industry? It’s hard to say. Take for instance Pepsi Next, which came out a couple years ago. 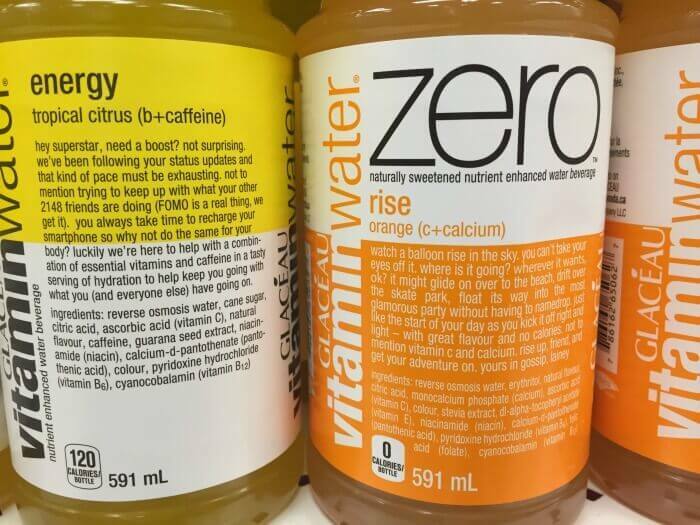 It’s advertised as being “sweetened naturally”, and yet a quick glance at the ingredients confirms that the second ingredient (after water) is still plain old, white, refined sugar. So where does the “naturally” claim come in? The fact that the sugar content is reduced with the use of Stevia. But that’s only 30% of the sweetening. The other 70% means we’re still drinking a canful of sugar. Another trick in the food industry is to use fancy-schmancy sounding names like “evaporated cane juice”, which sounds nicer than sugar, doesn’t it? Except that’s all it is. It isn’t raw or unrefined, and it’s a far cry from raw honey. It’s just sugar cane that’s been ground up, dried and turned into granulated sugar. Oh wait… isn’t that??? Right. Sugar. Can you read the small print at the bottom? 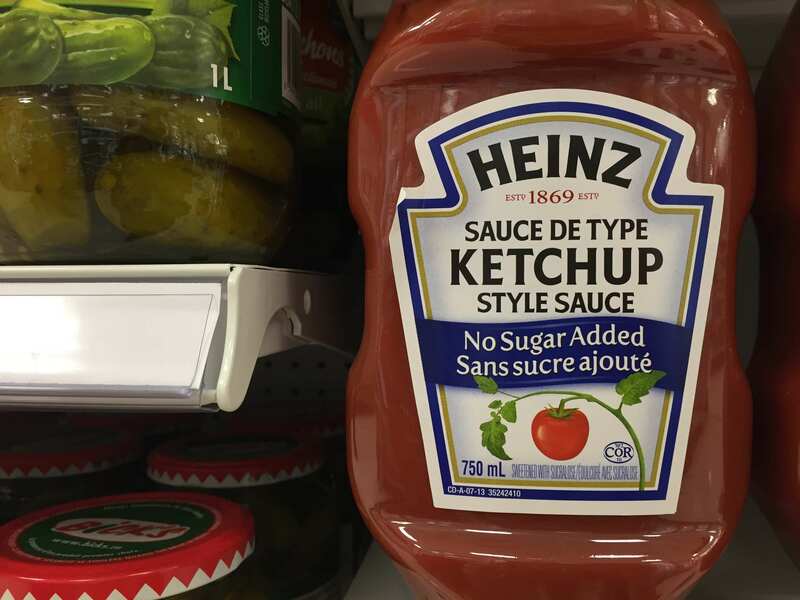 This ketchup is sweetened with sucralose (same as Splenda), an artificial sweetener. Possibly even worse than false claims of being naturally sweetened are the bold claims of “no sugar” or “reduced sugar” or “no added sugar”. Which sounds really good at first glance. sacharin, to name a few. Though consuming less sugar is a good thing, accomplishing it by way of artificial sweeteners is not so great (in fact, it’s actually dangerous). Yes, but are they naturally occurring in the food OR are they synthetic and added in during processing??? For another, there is absolutely no food substance in these drinks that is contributing to the vitamins and minerals they contain. Which means they’re as synthetic as what you’d get from a Flinstone or Centrum multi-vitamin. Strike two. This isn’t real food, and these aren’t the nutrients you’re looking for. These “Whole Grain” labels are popping up more and more, but there are a few tricks to watch out for. 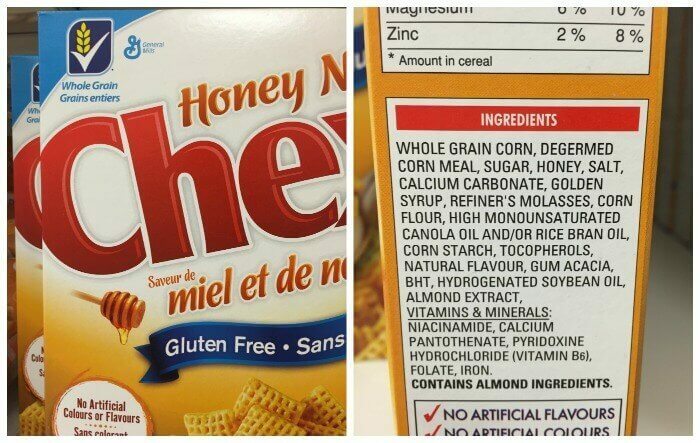 1) The whole grains might exist, but they could be wayyyy down the ingredient list in a supporting, not starring role. In other words, you’re getting a mostly refined product with just enough whole grains so they can stick it on the label. 2) It could be whole grains that really don’t give you any health benefit. Take this Chex cereal, for example. The “whole grain” in this is “whole grain corn”. Which we know is a GMO product, full of pesticides, not to mention the fact that we already get too much in our diets, and its not a particularly nutrient-dense grain to start out with, but especially in its processed state. 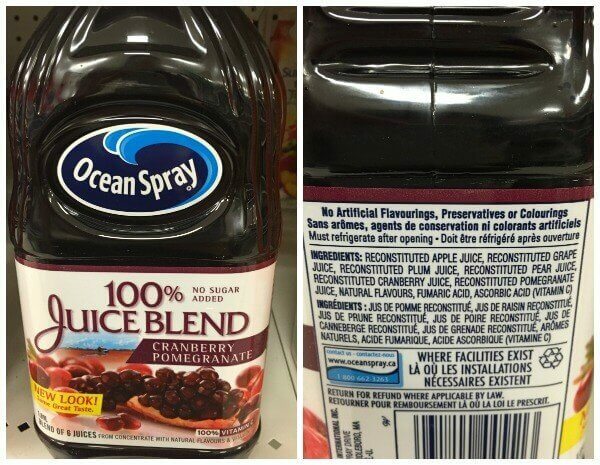 This “cranberry/pomegranate” juice blend may be made with 100% juices… except that the great majority of those juices aren’t cranberry or pomegranate — they’re apple, grape, pear and plum! Often the “real” thing a food is supposedly made with (ie. the cranberry in your cranberry juice, the fruit in a child’s fruit snack, the strawberries in the Strawberries’n’Cream oatmeal) is actually so far down the ingredient list you might miss it. Which means there’s hardly any of it. 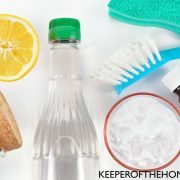 Ingredient lists work by starting with the most-used ingredients then going down (in order) to the ones used in only very small amounts (like the salt, baking soda or spices). And many times, the name itself has nothing to do with the ingredients at all. Take many maple-flavored foods. The maple flavoring is just that – fake flavoring and coloring, but NOT maple syrup itself. I couldn’t help but pick on Quaker Oats Instant Oatmeal and Instant Grits. In both instances, they don’t contain a speck of the food flavor suggested in the product name. 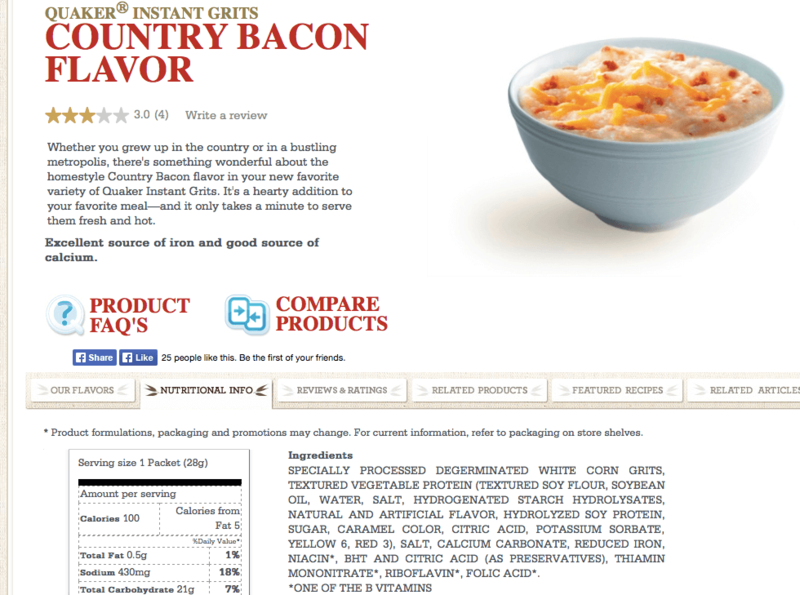 Note the severe absence of bacon anywhere in the ingredients (although they do contain a fake, meat-subtstiute made out of soy, dolled up with some hydrogenated starch and soy protein, and artificial flavors. Mmm, I love me a strip of some artificially flavored hydrogenated soy protein. 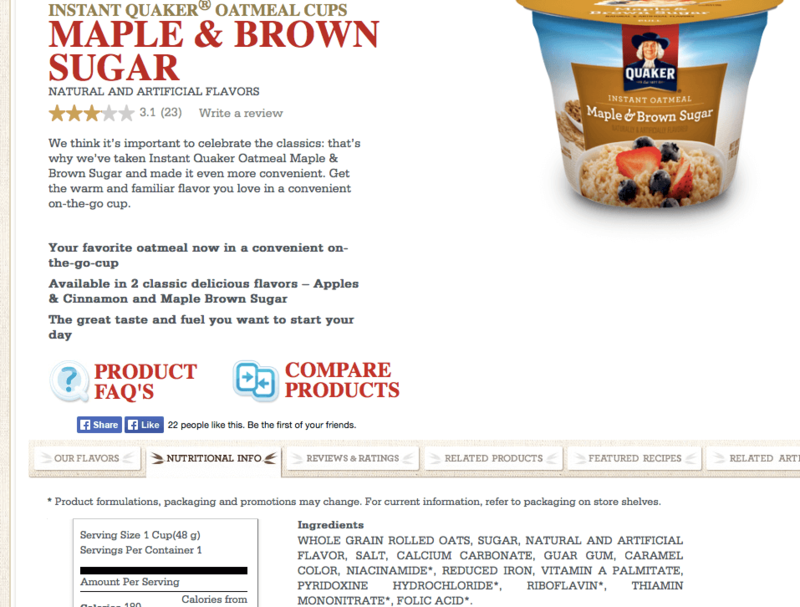 Again, this Maple & Brown Sugar Oatmeal Cup contains exactly zero maple syrup or even brown sugar. Instead you’ve got plain old white sugar fancied up with caramel color. Yummy. Phew… did that make your head spin? Has all of the marketing mumbo-jumbo got you confused yet? Or angry? What deceptive words or phrases have you noticed? How do you make sure that you don’t fall for their marketing? Images from: ilovebutter, theimpulsivebuy, Jeepers Media, m01229. Top image by Tim Samoff. I’ve been telling people for years that natural means nothing!! Thanks for sharing the info. It’s unfortunate, but true, right? Now that I am home with my kids I am teaching myself to cook. Which of course includes more unprocessed ingredients. It was HARD to buy anything but processed foods when they are so quick and easy after working so many hours before. It is really scary what is in our foods that we don’t understand. I am even more scared of the chemicals that are in the foods from the farms that are not on the labels. The topic of food always makes me feel powerless. “Vegetarian” eggs bother me – chickens are supposed to eat bugs!! I do buy organic macaroni and cheese evey so often for the kids – because then it doesn’t have artificial colors. The amount of artificial sweeteners is also astonishing and yu have to be so careful. My son has food allergies so I was hoping to get some oatmeal packets to take on various trips since breakfast is the hardest away from home with an egg allergy. However the lower sugar ones had sucralose. Ugh! I know, the bugs me, too! Or at fancier restaurants I sometimes see meat or poultry advertised as being grain-fed, as if that were a virtue. LOL! But I’ll admit that when we are totally strapped and feel the need to reach for a convenience food, we’ll also choose something organic, because even though we know it doesn’t have much nutritional value at all, it’s still less yucky than the other stuff. I love that we’re more aware but it can be overwhelming. All the bad ingredients and chemicals that are allowed to be put in our food is crazy. Now, I don’t want to buy or eat anything that has ingredients in it that I know are bad. I don’t want to go out to eat either. Even looking into buying a whole cow who’s been grass fed and treated humanely is hard to find. With God’s help and yours, I’m gaining more knowledge and feel better about what I’m feeding my family. Even my family husband is on board. You pretty much proved the rule about shopping around the perimeter of the grocery store, and keep your eyes open while you’re on the perimeter. However, is there any point in talking about Pepsi or cereals pitched toward kids? There is no way to make soft drinks (pop, soda, whatever you call it in your area) healthy. Why bother to pick those things up and read the labels? Why express shock and dismay that the less-sugar Pepsi still has sugar in it? I am not young and my family is grown, but they grew up eating food made from scratch. As an adult, try making all your bread for a year or so, and then eat some mainstream packaged bread. The chemicals will bite your tongue. 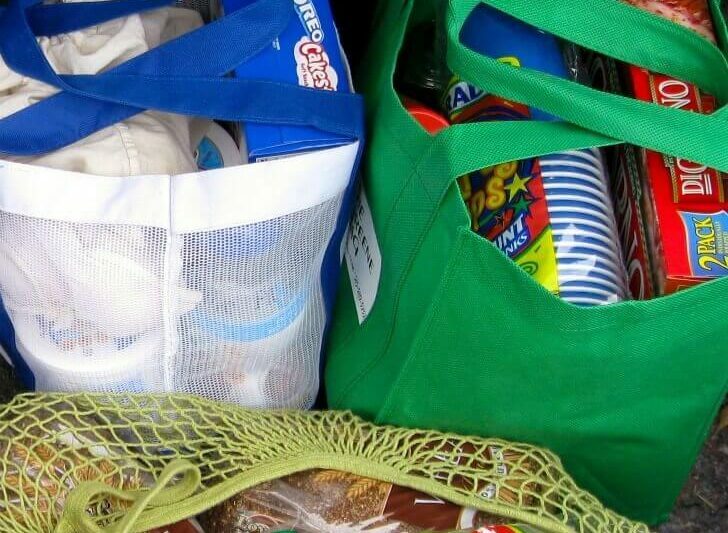 I still read labels, but I don’t bother to read labels on junk or try to buy ‘convenience foods.’ This was a good and helpful article for those who still hope to find something real in a box, though. The way to make change is to vote with your dollars. That’s all that corporations understand. Don’t buy the junk. 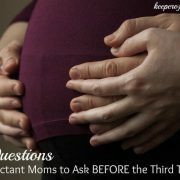 Really interesting and informative article! It was my understanding though that organic items had to be 95% organic, with no more than 5% of their ingredients allowed to be from the approved list of inorganic additives. ?? Decades ago in my high school chemistry class, my science teacher made a lasting impression on me as she demonstrated the “accuracy” of product labeling by taking a box of Total (fortified with iron!) and putting it into a large beaker that had a magnetic stirring device. She added water and turned it on. By the end of the period, she dumped out the soggy cereal and showed us what was left behind – iron filings covered the bottom of the beaker. Sure, it’s true that Total is fortified with iron… it’s just not fortified with the kind that we can digest! I’ve been cautious of labels ever since. Another clever switcheroo I’ve noticed in US foods is the Kraft Olive Oil Mayo. Sounds great, right? Olive oil instead of canola so what could be wrong? Except that, while olive oil is surprisingly the highest ingredient level of oil (first oil in the list), right after it are STILL soybean oil and canola oil. *facepalm* Granted, it has less soy oil than the regular mayo (where soybean oil is ingredient 1 but still. 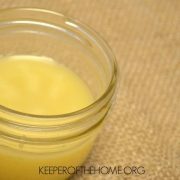 Olive oil mayo should be made with olive oil only…and that’s why I make my own! Lots of good points. I have always been irritated by the descriptive “natural”, since it means nothing. One thing I would like to comment on is your description of corn as GMO, and pesticide-laden. Yes, most corn is GMO, but because of that, there is almost no pesticide applied to the seed or the growing crop. I’ve been growing corn for over forty years. We used to have to douse it in pesticides and herbicides, much of which ended up in the soil and water. Now, we don’t. This is much better. Ten percent of each bag we plant is a non-GMO variety, to provide a refuge for insects so that resistance does not develop. I invite you to search for scientific research indicating negative effects of GMO crops. It’s been looked for for at least three decades, and not found. Plants have been “genetically modifying” themselves since the beginning of time. I believe that several decades from now, we will look back at the current anti-GMO popularity in the same way we look at the Luddites of the 19th century. By that time, the population of the earth will be over nine billion, and those people will not be concerned if their wheat, corn, or rice is GMO or not. They will be concerned, though, if there is not enough to go around. Overall a fun article to read. But the author seems to have problems reading labels correctly (Nutella has 21g of sugar not 31g per serving) and she seems to be still riding on the train of thought, that states that MSG is bad for you. But yeast extract is not MSG, it does contain glutamic acid whatsoever which is not MSG in disguise. If you want MSG eat tomatoes or cheese. There is a difference between “free glutamate “ which is yeast extract and “bound “ glutamate , which is found in real food . Free glutamate has the same affect on your brain …. it’s an excitotoxin , just like MSG , it kills brain cells … which can be a contributed to Alzheimer’s, Parkinson’s, ADHD… and a host of many many degenerative disorders .